When we backed our first manager in 2006, we looked for a manual that would help us to figure it all out. It didn’t exist. After the launch of our fourth firm, we thought it was time to write the book we hoped had existed back in the day. 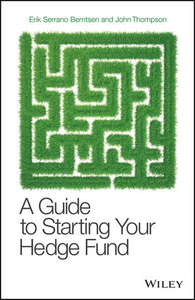 “A Guide to Starting Your Hedge Fund” became that manual, with the backing of the great people at Wiley and Sons, the world’s leading finance and investments publisher, it became a reality. The book is a practical “how-to” guide designed to help managers design and launch their own firms, and to help investors select and diligence emerging managers. At the very least you’ll enjoy the quotes at the beginning of each chapter.